As always we'll start with our DirectCompute game example, Civilization V, which uses DirectCompute to decompress textures on the fly. Civ V includes a sub-benchmark that exclusively tests the speed of their texture decompression algorithm by repeatedly decompressing the textures required for one of the game’s leader scenes. While DirectCompute is used in many games, this is one of the only games with a benchmark that can isolate the use of DirectCompute and its resulting performance. AMD does extremely well in our sole DirectCompute test, outperforming Intel's latest desktop graphics solution by a huge margin. 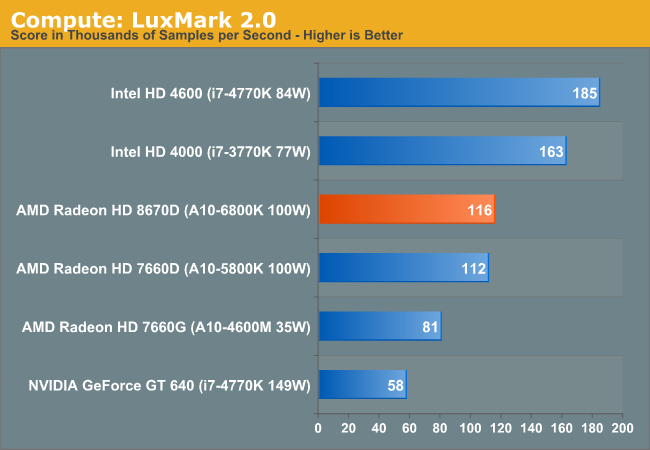 Our next benchmark is LuxMark2.0, the official benchmark of SmallLuxGPU 2.0. SmallLuxGPU is an OpenCL accelerated ray tracer that is part of the larger LuxRender suite. Ray tracing has become a stronghold for GPUs in recent years as ray tracing maps well to GPU pipelines, allowing artists to render scenes much more quickly than with CPUs alone. 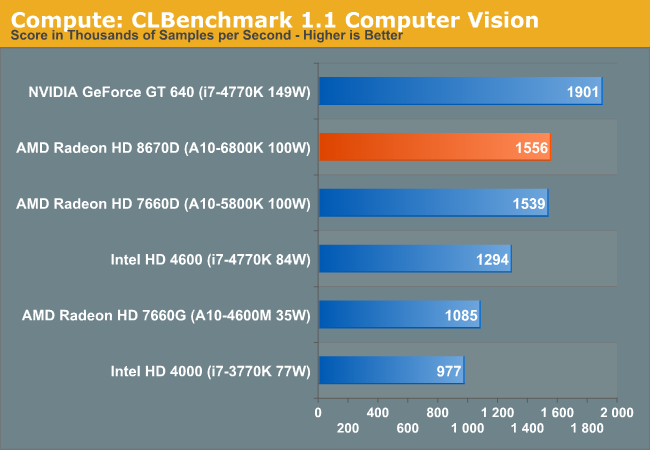 Haswell GT2's OpenCL performance can be very good, which is what we're seeing here. 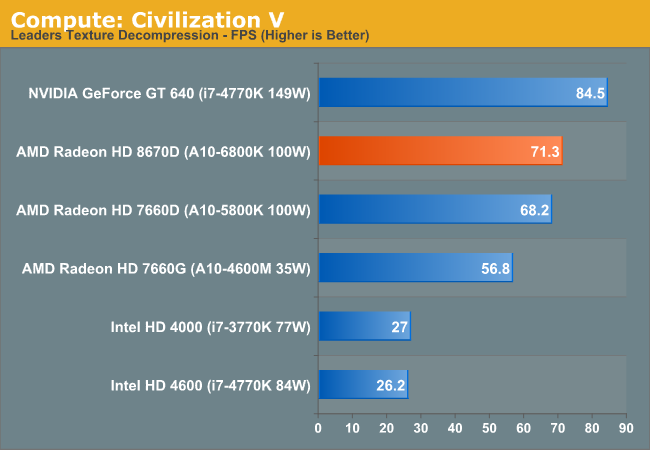 HD 4600 ends up being almost 60% faster than the Radeon HD 8670D. Our 3rd benchmark set comes from CLBenchmark 1.1. CLBenchmark contains a number of subtests; we’re focusing on the most practical of them, the computer vision test and the fluid simulation test. The former being a useful proxy for computer imaging tasks where systems are required to parse images and identify features (e.g. humans), while fluid simulations are common in professional graphics work and games alike. 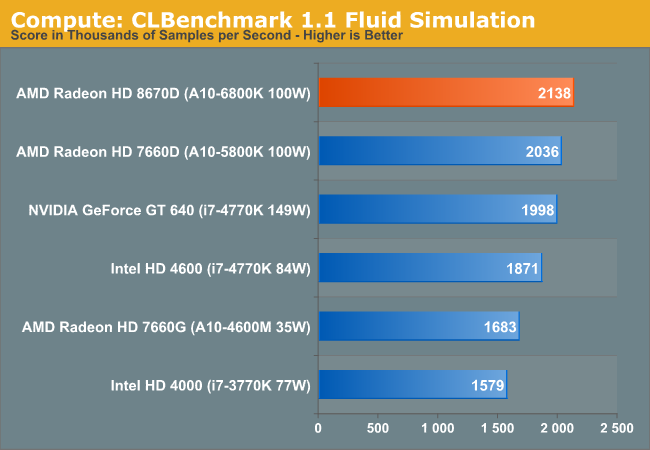 AMD and Intel trade places once again with CLBenchmark. Here, Richland does extremely well. 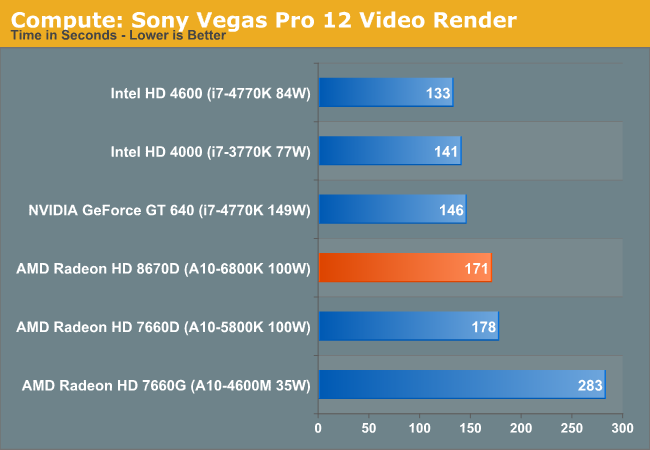 Our final compute benchmark is Sony Vegas Pro 12, an OpenGL and OpenCL video editing and authoring package. Vegas can use GPUs in a few different ways, the primary uses being to accelerate the video effects and compositing process itself, and in the video encoding step. With video encoding being increasingly offloaded to dedicated DSPs these days we’re focusing on the editing and compositing process, rendering to a low CPU overhead format (XDCAM EX). This specific test comes from Sony, and measures how long it takes to render a video. The last compute test goes to Intel, although the two put up a good fight across the entire suite. Because that makes no sense as a testing point. The i7 tested is not in the same price gap ether (an i3 would probably lose a lot of this partial CPU stuff) but the iGPU performance barely changes.